With Vidos Travel you get the opportunity to travel to an unusual destination as a Corfu visitor, to the close country of Albania. Your all day tour will begin from your hotel, where you will be picked up by Vido’s Travel buses to transfer you to the port of Corfu to take the boat to Albanian. First stop of your tour will be Ag. Saranda city and special the ancient city of Ag. Saranda. An additional guided tour is available for those who wish to enjoy a 20 km tour by bus of the south coast with it’s virgin shores and scattered islands. 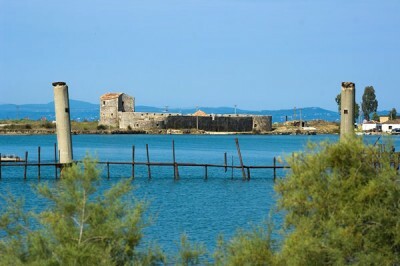 Next destination of your tour will be the excursion to Butrint, designated by UNESCO as a World Heritage site in 1997. You will be able to admire the ancient city of Vouthrota with it’s well maintained archaeological monuments and ancient theater, the ancient gymnasium, the Roman ablutions, the ancient temple with the priceless mosaic floor and the enormous stone walls. Upon the hill of Butrint, lies the castle of Ali Pasha an oddment of the Ottoman Empire and from this position climbing up the hill you will be able to photo shoot and enjoy the panoramic view of the Ancient City, the lake and the vast plains, a magnificent breathtaking sight. Taking the way back home you will have the opportunity to have your lunch to the city of Ag. Saranda and get a mini tour around the city until your boat departure time from the land is caught in time. As soon as you arrive back to the main port of Corfu island you will be transferred back to your hotel, where your tour had started.